We are a highly acclaimed Manufacturer, Exporter & Supplier of Digital Power Strapping Tools. The Digital Power Strapping Tools, offered by us, are compact and easy to use battery strapping tools for PP and PET straps of 16 to 19 mm strap widths. Utilizing a powerful motor, Digital Power Strapping Tools are capable of applying tensions up to 3400 N. The higher capacity lithium ion battery of the Digital Power Strapping Tools is made by Makita and enables more strapping cycles and has no memory effect with a longer life expectancy. The battery of the Digital Power Strapping Tools is capable of achieving complete charge within 20 minutes without battery heating, with the charger being optional. The ergonomic handle and the balanced weight distribution of the Digital Power Strapping Tools enable a â��one-handâ�� use of the tool. The tension and sealing time are adjusted via a simple digital panel.Â The Digital Power Strapping Tools provide seal-less friction and are weld joint type. 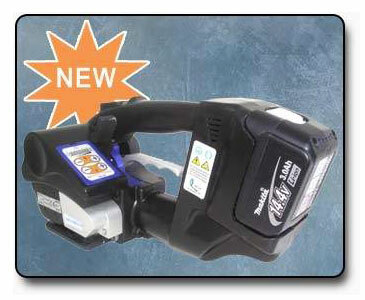 The Digital Power Strapping Tools are light-weight with a 3,9 kg weight inclusive of the battery. Package Type Flat Surface min. Length 120mm -- 5" Round Surface min. diameter 700mm, -- 28"